“Lucky Ducky’ is a pristine home within walking distance of the pool and the beach. 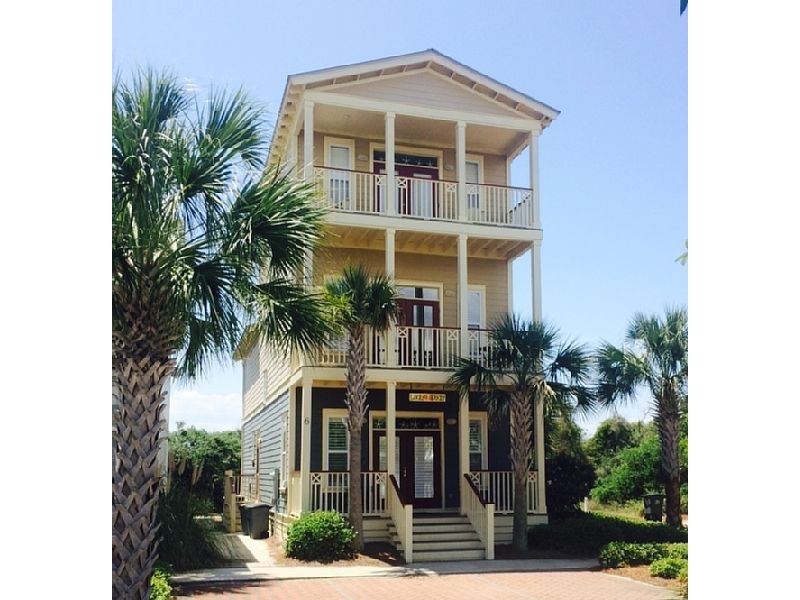 You will truly feel LUCKY once you see this beautiful home which is in the perfect location in the sought-after, private community of Seacrest Beach. Lucky Ducky sits directly on Scenic Hwy 30A , 100 yards from the sugar white sand beach, 50 yards from the majestic 12,000 SF pool, 100 yards from chic Alys Beach, which also has a wonderful kid’s playground and 2 blocks from world-famous Rosemary Beach. — 4 LARGE bedroom SUITES each with a private in-suite full bathroom. — We stock the home with everything you need like cleaning supplies, washing and dishwashing detergent, a big box of trash bags, full size shampoo, conditioner and shower gel and lots of beach towels. This is a 3 story home with hardwood floors throughout except for carpet in 3 of the bedrooms and tile in the bathrooms. On the first floor you will enjoy a spacious family room, gourmet kitchen with granite counters and breakfast bar, stainless steel appliances and chic dining area. Additionally there is a bedroom with a King bed and full bathroom with shower. This bedroom has a private deck and also leads out to the patio with a couple of rocking chairs, a ceramic, charcoal grill and larger than life checker board. We are on a corner lot with no neighbors in 3 directions which gives ultimate privacy while still being on 30A and part of all the action! Each bedroom in the house has an air purifier / sound machine which keeps the air fresh and creates a wall of white noise for sleeping comfort. The second floor has a super-sized MASTER SUITE with a King bed, sitting area, TV and large bathroom with a Rain-Shower, separate soaking tub and dual sinks with granite vanity. Double French doors lead to a private deck with Gulf Views. Down the hall from the master is a spacious bedroom perfect for the kids with 4 twin beds and a private in-suite bathroom with shower and dual sinks with granite vanity. This room also has a private deck and lots of windows and light. The third floor is a true haven with an even larger MASTER SUITE with a King bed and large open floor space. The in-suite bathroom has a shower, separate soaking tub and dual granite vanity sinks. Double French doors lead out to a private deck with rocking chairs. The third floor is completed with a wet bar, refrigerator, ice maker, blender, microwave and coffee maker. This makes it easy to enjoy the large top floor deck which is the perfect place to watch the sunrise and sunset while enjoying the panoramic water view.